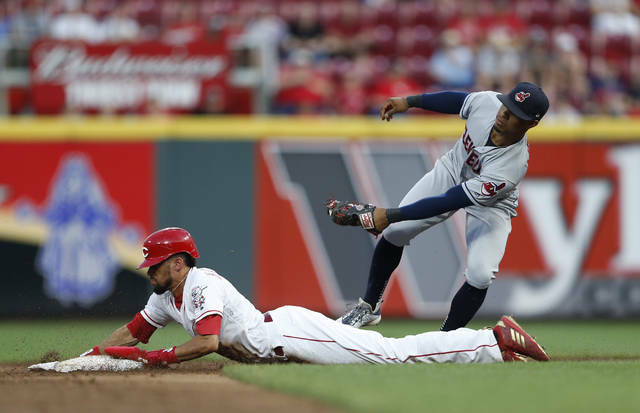 CINCINNATI (AP) — On a day when the Cleveland Indians lost key starter Trevor Bauer to an injury, ace Corey Kluber gave them a huge lift. 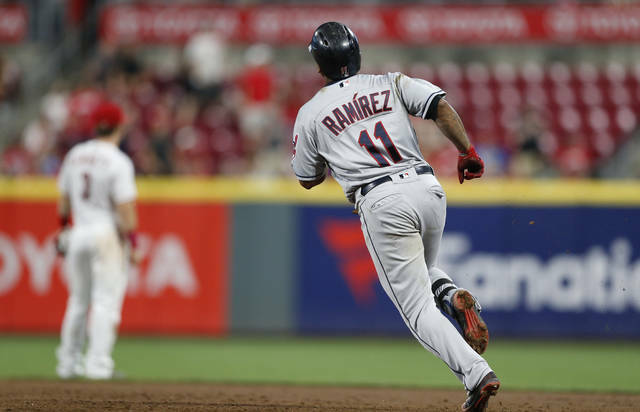 Kluber extended his dominance of the Cincinnati Reds with seven strong innings and Jose Ramirez hit his 36th home run as the Cleveland Indians rolled to an 8-1 win on Tuesday night. Kluber (15-6) allowed one run and five hits and struck out seven in seven innings. He was efficient throughout, never throwing more than 19 pitches in an inning. He threw nine pitches in the first inning and seven in the fourth. 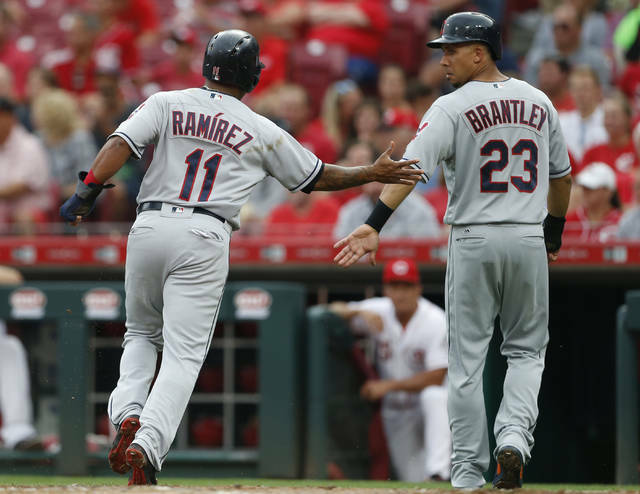 The Indians won the first two games of the series by a combined 18-4 despite a rough week with outfielder Leonys Martin hospitalized with a serious bacterial infection and Bauer placed on the DL with a fractured right leg on Tuesday. Cleveland sent nine batters to the plate in the first inning scoring four runs on four hits, including a two-run single by Yonder Alonso. Third baseman Eugenio Suarez’s diving stop on Yan Gomes’ hard grounder prevented further damage. In the second inning, Ramirez doubled and scored on Alonso’s sacrifice fly and an RBI single by Melky Cabrera made it 6-0. Romano (7-10) left after allowing six runs and seven hits in 1 2/3 innings, the shortest start of his career. Michael Lorenzen pitched a career-high 4 1/3 innings, tying Keury Mella’s outing on Aug. 2 for the most by a Reds reliever this season. Ramirez’s solo homer on a 3-2 pitch from Lorenzen in the sixth made it 8-0. He also homered in the third inning on Monday. Kluber retired the Reds in order three times. He struck out three straight batters in the sixth after allowing Billy Hamilton’s leadoff single. The only run Kluber allowed was when Tucker Barnhart tripled for the second time this season and scored on Preston Tucker’s single in the seventh. In his past four starts vs. Cincinnati, Kluber is 4-0 with a 1.80 ERA. Tyler Olson, recalled from Triple-A Columbus on Tuesday, pitched a scoreless ninth inning for Cleveland which has won four straight games. The Indians have won 14 of their past 18 road games. In those games, Indians pitchers have posted a 2.81 ERA. Indians: Trevor Bauer went on the 10-day disabled list on Tuesday with a small stress fracture in his right fibula. Bauer was struck by a line drive on his right ankle on Saturday and a MRI on Tuesday revealed the fracture. There is no timetable for his return. Reds: Scott Schebler experienced no issues with his sprained right shoulder while throwing on Monday. He could be sent out for a rehab assignment at either Triple-A Louisville or Double-A Pensacola later this week. Indians: Rookie right-hander Shane Bieber (6-2) will make his 12th start of the season and face the Reds for the first time. Reds: Robert Stephenson (0-1) will make his second start since being recalled from Triple-A.